Real Asian Beauty: Beauty Bound Asia : The Hunt for the Top Beauty Creator in Asia has begun! 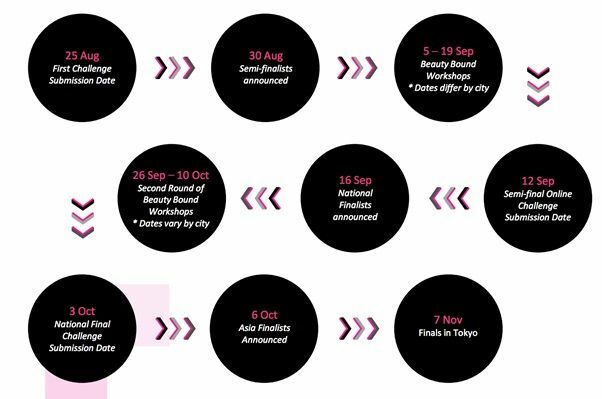 Beauty Bound Asia : The Hunt for the Top Beauty Creator in Asia has begun! Luxury skin care brand SK-II presents Beauty Bound Asia on YouTube – the region’s first digital search and creator cultivation program for emerging online beauty talent. It is a once-in-a-lifetime opportunity to interact and learn from the world’s best beauty creators, beauty brands, and digital experts. With exciting time-based challenges, mentorship programs and workshops curated and led by top beauty influencers in Asia and industry experts, Beauty Bound Asia is a ground-breaking initiative designed to help discover and cultivate the next generation of online beauty experts. “SK-II recognizes the fast paced landscape of modern beauty and the growing importance of digital beauty influencers. As part of our brand’s #changedestiny philosophy, we’re proud to be part of this opportunity to support, empower and grow the creator community further, and authentically engage with the next generation of beauty experts.” - Seth Sandeep, Marketing Director, SK-II Global. Beauty Bound Asia will be open to all legal residents of 11 cities where the contest is taking place including Tokyo, Seoul, Osaka, Taipei, Hong Kong, Manila, Bangkok, Kuala Lumpur, Singapore, Jakarta, and Sydney. As part of this program, YouTube and top YouTube stars will be supporting this initiative by offering skill-building workshops for Beauty Bound Asia finalists. “At YouTube we’re always looking to find new ways to empower people to create, broadcast, and share. By offering YouTube workshops for Beauty Bound Asia, we hope to inspire and support the next wave of online beauty and fashion creators across Asia.” – David Powell, Director, YouTube Online Partner Development, Asia Pacific. Coaches include the original beauty YouTube Michelle Phan with over 7.8 million followers on YouTube and over 1.9 million on Instagram. Michelle has always been a passionate supporter of the global beauty creator community. In addition to co-founding Ipsy, the world's largest online beauty focused community, she has also been a huge creative force for Beauty Bound; personally designing a number of the beauty creator challenges, and mentoring and judging the finalists from each city in the Tokyo program finale. The rest of the region's top beauty creators have also extended their support as coaches, with talented beauty gurus like Sasaki Asahi (Japan), Calary Girl (Korea), Momay (Thailand) and Wengie (Australia) amongst many others. Then you are eligible to join, no prior experience necessary! WHAT IS IN IT FOR THE CREATORS? If you are a beauty creator, then this is a chance that you should not miss! Definitely a once-in-a-lifetime chance to build and grow your channel/audience and to work with top YouTube stars! I will be there as one of the judges to help you guys with your journey to top and be the ultimate Beauty Bound Asia Creator! Check out BEAUTY BOUND ASIA's website for more details. Don't forget to join this exciting event! See you all there!